The Carson City center is approximately the area of Nevada State Capitol and the area of Downtown Carson City. Holiday Inn Express & Suites Carson City : 4055 North Carson St.
Rates shown are nightly rates before taxes and do not necessarily reflect all Carson City, NV discounts available. 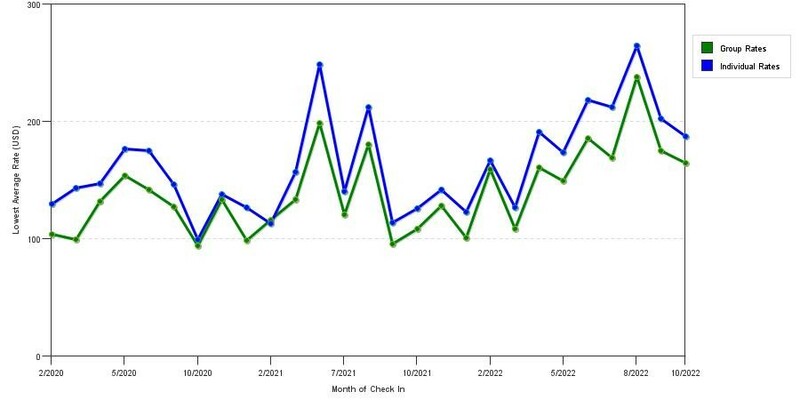 The chart reflects the cheapest Carson City hotel for each day and each star rating category. Carson City isn't Las Vegas' less-exciting little brother. It's a historic, exciting town with plenty of entertainment options to keep you transfixed throughout your vacation. It perfectly encapsulates the American West, and it also happens to be the state capital. You'll find plenty of history in this city as well as the chance to explore natural wonders unique to this part of the world. If you're considering a trip to Nevada, Carson City offers the perfect choice. You'll need a great hotel from which to explore this city, so consider your budgetary constraints as well as your amenity preferences to find one that meets all of your needs. Summers prove most popular among tourists in Carson City as well as the rest of Nevada. Despite the heat, visitors arrive in droves to gamble, swim in Lake Tahoe, and enjoy all the other entertainment options this city has to offer. They also enjoy hiking and engaging in other outdoor activities, especially since rainfall is rare during this season. However, if you're sensitive to heat, you might want to avoid the middle of summer, concentrating instead on the milder seasons. You can still explore the outdoors, take hikes, and even dip a toe or two in Lake Tahoe, but you'll get better rates on hotels and you won't have to fight the crowds at your favorite tourist activities. Snowbirds, on the other hand, should visit Carson City during the winter. It's an excellent skiing and snowboarding destination, and as long as you're comfortable in the cold, you'll have a blast. The ski season in Carson City and nearby resorts lasts from November until April or May, so you can target those months if you want to hit the slopes. 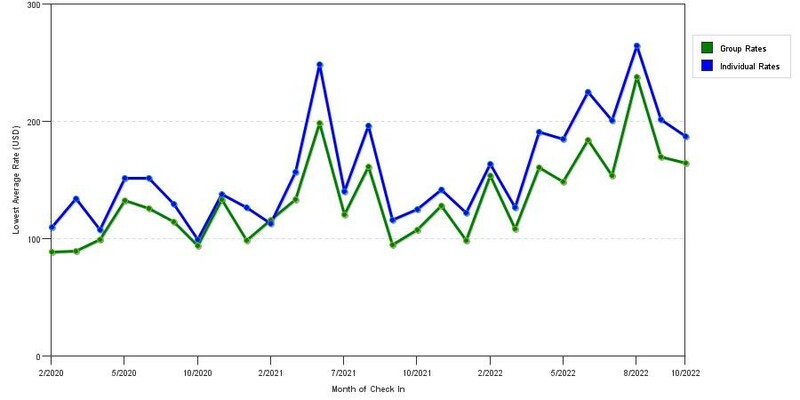 Keep in mind that hotel rates and crowds also increase during holidays. If you prefer fewer tourists to get in your way, avoid holidays such as Thanksgiving, Christmas, Labor Day, Memorial Day, and New Year's. Below are 3 charts demonstrating mean price trends by star rating class in Carson City, NV. 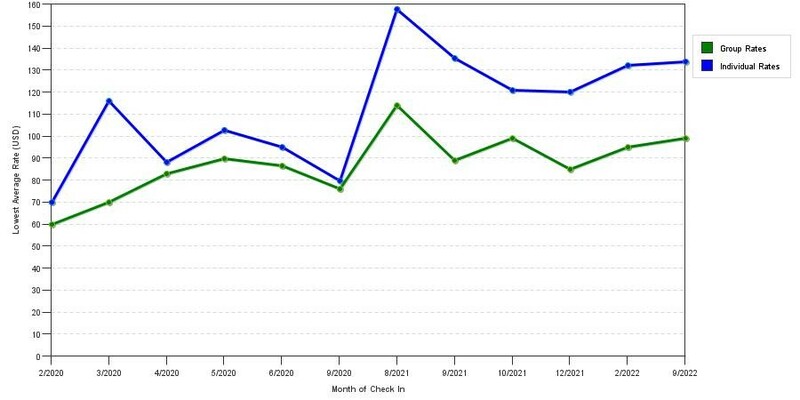 You can use these line graphs to evaluate the best time to book a room in Carson City for your upcoming travels. This city doesn't just offer affordable hotels with limited amenities. It's also rich in luxurious accommodations for those who want to splurge a little more on their Carson City vacations. Consider the Gold Dust West Hotel & Casino, for instance. It's perfect for guests who want to spend a few bucks at the roulette wheel or on the slot machines thanks to the on-site casino. However, it doesn't just cater to gamblers. There are two on-site restaurants that serve delicious cuisine: The Grille, which serves steak, American favorites, and other meal options, and Olé Olé, which serves authentic Mexican cuisine in a romantic setting. There's also an on-site bowling center if you feel like donning ugly shoes and challenging your traveling companions to a game. Although the Gold Dust West Hotel & Casino has an on-site RV park, you'll probably want to reserve one of its guest rooms or suites. Perks like in-room whirlpool hot tubs, 23-inch flat-screen televisions, premium linens and toiletries, and pillow-top mattresses make a night at this hotel worth the price. Alternatively, check out the City Center Hotel Carson City. It's a more traditional hotel, favoring Victorian furnishings and antique decor that will transport you to another time as soon as you step foot into the lobby. The rooms are large and clean, with enormous beds that feature ornate headboards and premium bedding. Elegant touches like accent pillows and plants help your accommodations feel more like home. Amenities at the City Center Hotel Carson City include free wireless internet, daily newspaper delivery, refrigerators in every room, microwaves available upon request, in-room coffee makers, and a friendly staff. You can lounge in the lobby, which features an ornate fireplace and an assortment of reading material. For the utmost luxury, upgrade to a suite so you'll have more room and extra seating. When you're looking for budget-friendly accommodations in Carson City, start with the Rodeway Inn at Nevada State Capitol. It's close to several hot attractions, such as the Nevada State Museum and the Washoe Lake State Park. You'll start each day with a free hot breakfast and all the coffee you can drink. Plus, this hotel delivers a daily newspaper to your door so you won't feel completely disconnected from the outside world. There's an outdoor pool that remains heated for use all year long and a guest laundry facility with coin-operated machines. Guest rooms feature minimal furnishings and decor, which creates a sense of more space than the room actually offers. The understated color palette and individual climate control will help you fall asleep every night in complete comfort. There's a small dining table in each room with a couple chairs as well as a bureau and a work desk. The Super 8 Carson City offers a wallet-friendly option, as well. The free SuperStart breakfast will help you fuel up on calories for your outdoor adventures in Carson City. You'll also have a microwave and a refrigerator in your room so you can make small meals to save money and keep your beverages cool while you're sightseeing. There's free wireless internet access throughout the venue so you can stay connected with friends and colleagues back home. The lobby at the Super 8 Carson City offers a place to gather with traveling companions and other guests. The comfortable sofas and armchairs also prove relaxing if you feel like curling up with a good book or perusing a few magazines. Of course, if you'd rather stick to your room, you'll have a flat-screen television with cable channels to keep yourself entertained. Which Carson City hotels have real discounts? You can reduce your overall travel costs if you take advantage of discounts. For instance, if you stay in Choice hotels like the Rodeway Inn at Nevada State Capitol, you can save up to 10 percent on your hotel bill. The discounts apply to AAA and AARP members as well as senior citizens, government workers, and military service members. You can also save up to 20 percent by booking your rooms early. You can find similar deals at the Super 8 Carson City. AAA, AARP, and CAA members can save up to 10 percent, while government workers also get non-publicized special rates. Several Carson City hotels, such as the Gold Dust West Hotel & Casino, offer loyalty programs, as well, that help you save money on hotel stays as long as you stick with the brand. If you're looking for the best value in Carson City, book a room at The Plaza Hotel. It's one of the oldest hotels in the city, which means you might find a few signs of wear and tear, but it's held up extremely well and guests report that it offers clean, comfortable accommodations. It's also a quiet venue, which benefits guests who awaken easily when confronted with noise, and there's a continental breakfast served every morning. This centrally located hotel will put you right in the middle of Carson City's downtown district, which makes it ideal for guests who love exploring nightlife. Alternatively, stay at the well-reviewed Hardman House Hotel. It's housed in a unique second-empire Victorian building with spires on the roof and charming arched dormers. There are 62 rooms spread across the hotel's three floors as well as six suites. You get free wireless internet at this establishment, and the continental breakfast offers the usual fare. You'll love your spacious room, which offers a flat-screen television, microwave, refrigerator, premium cable channels, charming old-world decor, and an iron and ironing board. Carson City is brimming with outdoor attractions that will keep your heart rate up and allow you to enjoy the breathtaking scenery that surrounds the state capital. There's an easy trail that winds along the Carson River, for instance, that leads to Riverview Park, which has a dog-friendly area if you're traveling with your pooch and feel like letting him or her off-leash. For a slightly more challenging hike, climb to the top of Prison Hill. You'll get an amazing view of the city from the top of this hill, so don't forget your camera at the hotel. Alternatively, if you want to center your outdoor activities around Lake Tahoe, test your bravery with a hang-gliding session or go for a swim in the beautiful water. Carson City offers something for everyone, whether you're interested in the outdoors, history, shopping, nature, or plain old relaxation. Choose one of the hotels recommended above and start planning your trip today. What did travelers think of the city of Carson City? Below are reviews of the city of Carson City, NV from an actual visitor's perspective. Quiet hotel and nice rooms accommodations.